Vista, Calif.- It is a revolutionary cooking appliance that transforms everyday food into gourmet-quality meals. It is compact, quiet and uses little energy. Cuts of meat that are often difficult to prepare, such as flank steak and brisket, emerge fork-cutting tender. And with the AquaChef® Sous Vide Smart Cooker and its sous-vide method of preparation, it is virtually impossible to undercook or overcook food. 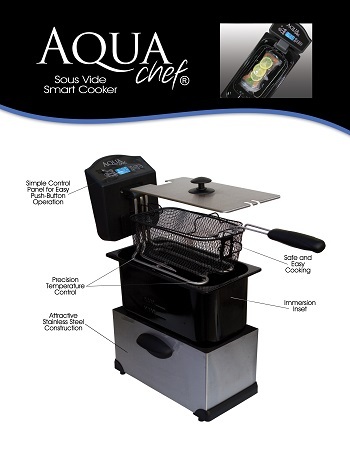 Developed by KitchenAdvance, the innovative AquaChef makes it simple for home cooks of all skill levels to prepare mouthwatering meats, fish and other items. Sous-vide (pronounced sooveed) is French for "under vacuum." So, in a foolproof system that eliminates guesswork, ingredients are placed in a vacuum-sealed bag and submerged in the water-filled oven, which is preset to the final and most desirable consumption temperature. "The AquaChef technique guarantees that you get moist, succulent meats and perfectly cooked meals every time," says Chef Melissa Silva-Torcedo, AquaChef Test Kitchen Director. "All you need to do is seal the seasoned food inside a vacuum-sealed bag, submerge it in the water bath at the required temperature and walk away. Food is cooked at the finished temperature, so that it never ends up raw or dried out." The AquaChef Smart Cooker and its accessories retails for $219.95, or less than half the cost of other sous-vide systems found at pricy kitchen stores. It also comes with KitchenAdvance's Seal 'N Fresh™ Handheld Vacuum System, and a set of Seal 'N Fresh™ Vacuum Bags. "Only three simple steps are involved," adds Silva-Torcedo. "You add fresh herbs, spices and even sliced lemon to the vacuum-sealed bag, which gives you more intense flavors and textures. Then, set the desired temperature, which can be found in our AquaChef Cookbook." With a push of a button, the Vacuum System removes the air from the bag and locks in the food's flavors, nutrients and moisture. The sous-vide method was originally described in 1799 and was re-discovered in the mid-1960s as an industrial process to preserve food. It was essentially reinvented in the mid-1970s by chef Georges Pralus of the famed Restaurant Troisgros in Roanne, France, who applied the method to cooking foie gras. The technique enabled him to retain the fat content and improve the texture of the goose and duck liver. Others followed, experimenting with different foods and recipes, and the method is now used in many high-end restaurants and by chefs such as Paul Bocuse, Thomas Keller, Charlie Trotter and John Tesar. With conventional high-heat cooking such as roasting or grilling, the food is exposed to heat levels much higher than the final and most desired internal temperature. In fact, the food must be removed from the high heat prior to reaching its internal temperature goal, the timing of which is a natural talent, a professional learned skill, or a futile attempt that consistently leads to overcooked pot roast. What's more, with foods such as chicken and fish, a sufficiently high internal temperature is critical to food safety. Because the AquaChef's cooking bath is set at the target internal temperature, there is never a doubt about producing a perfectly cooked recipe. The system also guarantees that irregularly shaped or thick items are cooked evenly throughout. 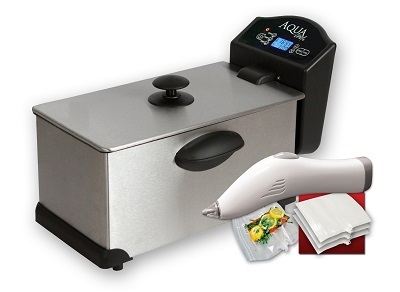 The AquaChef is perfectly suited for the growing trend of "slow food," or items cooked over long periods of time at low temperatures. Cooking times in the AquaChef can vary greatly. A thin piece of fish or a small chicken breast may be finished in a few minutes; cooked too long and at too high temperatures breaks down the enzymes in these foods, turning them into mush. For beef brisket and short ribs, 48 hours of slow cooking is the recipe for culinary greatness. At high temperatures, the proteins in meat can be denatured, which means the texture toughens as moisture evaporates. At lower temperatures, cell walls in the food—and in particular with vegetables—do not burst. With sous vide, vegetables can be cooked below boiling point, so that they don't become extremely soft and too tender, and instead retain a firm and somewhat crisp texture. Because the food in an AquaChef has been cooked in a sealed bag and is not exposed to air, it can be refrigerated and stored for a considerable period. Ideal for home cooks of any skill level, the AquaChef Smart Cooker is one of the most versatile compact kitchen appliances on the market today. Home cooks can tenderize tough, less expensive cuts of meat; eliminate added fats or oils; keep foods at the correct temperature until they are ready to serve; and enjoy easy cleanup. Economical, healthy, and restaurant-worthy meals are easily prepared with the AquaChef, including everything from a ham and eggs breakfast to steak and potatoes dinner. About KitchenAdvance: KitchenAdvance believes in making gourmet cooking easy and affordable. Working with suppliers and designers to develop quality and cost-effective alternatives to high-priced cooking equipment, it is committed to helping people cook better, healthier, and have more fun doing it. Since 1987, KitchenAdvance has worked to discover and provide gourmet-cooking solutions. 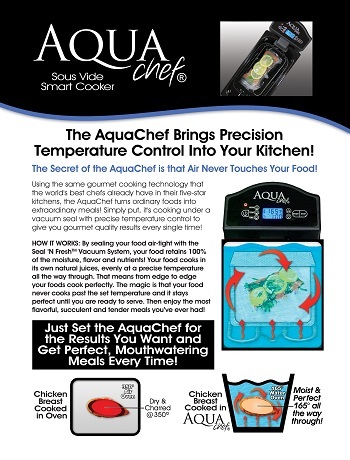 For more information, visit www.aquachef.com.